Rick has School Shows about people, languages and instruments from around the world, insects, the science of water and the water cycle, healthy eating and exercise, non-bullying, and a special program composed of 3 sessions to encourage Kindergarten, first and second grade readers or accompany Running Start or other reading incentive programs. Each summer he writes a new show to accompany the Collaborative Summer Library Program. Your child's Birthday Party will be a memorable one, when Rick brings an interactive story to life. And Rick has a collection of songs, puppets, and stories for Preschools, to get the little ones moving, grooving, and singing along! Read on to find out what programs Rick is currently offering. This is the perfect program to encourage young readers to exercise their emerging skills and develop a love of reading. Rick visits your school three times. On the first visit he goes into each classroom in the grade level for a half hour to present a biography and an original song about an author chosen by the teacher. Rick teaches the song to the children and leaves a CD recording of it. Authors include Jan Brett, Eve Bunting, Eric Carle, Joanna Cole, Doreen Cronin, Roald Dahl, Tomie DePaola, Lois Ehlert, Jean Craighead George, Gail Gibbons, Kevin Henkes, Pat Hutchins, Ezra Jack Keats, Steven Kellogg, Leo Lionni, Arnold Lobel, Robert Munsch, Laura Numeroff, Patricia Polacco, Jon Scieszka, Dr. Seuss, Shel Silverstein, Mark Teague, Chris van Allsburg, David Wiesner, Mo Willems, and Audrey Wood; but a new song can be composed for an author not on the list. Classes spend the next month or so enjoying books by the chosen author. On the second visit Rick returns to each class to review their song and introduce other songs about reading and books. The third visit is an assembly, during which each class comes up front to present their song to the other classes and invited parents. Rick completes the assembly by playing and singing interactive songs. Grades K to 3. $100 per class, plus travel fee depending on the distance from my home to your school. Lex the Lion (one of Rick's puppets) injured himself in a fall and is feeling sad. His puppet friends decide to cheer him up. They will stage a show in his honor, playing music and bringing Lex their favorite books to read while he recuperates. Rick has agreed to host the show but, when the friends show up to rehearse, they don't seem to know much about their instruments nor how to play them. Rick explains about vibrations and sound and how they work so the instrument can make rhythms and melodies. Audience volunteers come up to try the kalimba, glockenspiel, various drums and shakers, and other instruments. With Rick's help, they discover how the sounds change when beaters of various materials hit the drums or when padding is placed around the keys of the glockenspiel. Rick shows them how math works in music to play octaves and notes of varying lengths and in varying patterns. They see how a metronome can be adjusted to make music move fast or slow. After some musical instruction, the puppets share the book they have brought for Lex, before going back home to practice for the show. After the last puppet has left, Rick and the audience use his guitar to sing the summer library theme song he has written for Lex's show. Your audience will experience a combination of science, math and music, and be introduced to some great books! This show lasts 50 minutes and is appropriate for children, ages 4 to 10. $225 plus a travel fee if more than 25 miles from North East, MD. Think, design, assemble, test, improve! In this program, Rick is an engineer, who runs a shop where people can bring inventions that aren’t working the way they had hoped. His first customer of the day is a dragon puppet. The dragon has made a little merry-go-round for her dragon amusement park. She shares part of Feivel’s Flying Horses by Heidi Smith Hyde with the kids, to show them where she got the inspiration for her merry-go-round. The dragon’s problem is that it won’t turn. Rick takes a look and, with suggestions from the audience, figures out that the top and the seats are resting right on top of the base, creating too much friction. We decide that we can use marbles, which act like ball bearings, to reduce the friction and set the ride in motion! Throughout the rest of the show, other puppets enter the shop to get help and share books with the kids. The dinosaur’s hoist that can’t lift his fossilized bones out of the ground, the lion’s one-note guitar, and the flower's quest for new colors all need assistance from the audience. At the end of the show, after being introduced to several books and principles of physical science, and having fun designing like an engineer, the kids will join in singing Books Build a Better World. The Build It Better Shop lasts 50 minutes and is appropriate for children, ages 4 to 10. $225 plus a travel fee if more than 25 miles from North East, MD. The Chef uses music, humor, science and math to show how healthier eating and 60 minutes of exercise a day will help kids feel better, think better, and live a long and happy life. Along the way he shares excerpts from children’s books for the kids to identify. The show begins as the Chef recounts his past poor eating habits and lack of exercise, with a look at very unhealthy snack foods. Then he introduces his (puppet) friends : Edgaar the Dragon, Mickey the Moose, the Pirate, the Bookworm, and his dog, Bonnie, who helped him eat better meals, watch his calories, and find fun in exercise! The audience will enjoy making a super duper veggie fruiter sandwich, guessing how many calories were in those French toast sticks they gobbled down for breakfast, and getting up and moving. The Chef’s Pizza Song is a workout by itself! Your audience will enjoy lots of great children’s books, singing along with the Chef, and volunteering to become part of the show!! Shows are appropriate for ages 4 to 10. $225 plus travel fee if more than 25 miles from North East, MD. Rick has come to share some great children's books and to use them to point out the elements that make up a good story. But when he gets to the part of the story, where the characters have a problem to solve, a super hero appears, thinking someone needs saving. The super heroes are Rick's puppets, complete with masks, capes, and super powers. After Rick explains that he was only sharing a story and that no one is in real danger, the mistaken hero demonstrates their special power. The Turtlenator shows his "lightning speed"! Power Plant grows to amazing heights with just sunlight, soil and water! After several more books and confused but eager heroes appear, Rick decides to make up his own story. But, when it isn't as easy as he thinks, Rick really does need help. That's when Super Writer appears! This greatest of the super heroes helps Rick and the audience choose some story elements to get them started. Then they use them, along with some props and their imaginations, to bring a new story to life. At the end of the story, Rick invites the audience to join him in singing "Books Can Be Heroes". The audience will enjoy books, puppets, improvisation, play acting, story telling, and music! The program is appropriate for ages 4 to 11.﻿ $225 plus a travel fee if more than 25 miles from North East, MD. Sparks is an ancient wizard. He has lived through ages of invention and the fizzes and booms of his spells and potions have always been able to amaze the kings he has served. But now, in the digital age of computers and gaming devices, the current king is no longer satisfied with the wizard's work. Remembering that the king and his queen have a young prince and princess, Sparks decides to make them some simple but entertaining toys to win back the favor of the king. Sparks gets ideas for handmade toys with the help of several children's books, then he and the audience assemble them. Song and Dance Man by Karen Ackerman insires a wooden limber jack. Volunteers come forward to help Sparks put one together and make him dance! Poppleton Has Fun by Cynthia Rylant takes the audience to the movies. So Sparks shows how to make a thaumatrope, a device from the beginnings of animation. By the time the show ends with an interactive summer library theme song, the kids will have been introduced to some toys they can make at home, the science that makes them work, and of course, great books for young readers! Ages 4 to 10. 50 minutes in length. $225 plus a travel fee if more than 25 miles from North East, MD. Mike is a miner for the Great Books Mining Company. As he explains how he digs books from the walls of the mine, an earthquake happens! Everyone is just fine but it will be a little while before the rescue crew can reach them. To pass the time, Mike shares a book he found in the mine. Before long, he's interrupted by a succession of tunneling puppets. Each one shares one of the books they have buried underground. The books lead to songs, jokes, and wordplay, as the puppets try to entertain the trapped visitors. The worm invites volunteers to help him with his song, "All Worms Dance". The ant shows them close-up photos of everyday objects to see if they can tell what they're seeing. A hedgehog enagages them with some knock-knock jokes. A dinosaur skeleton puppet re-assembles himself with some help from a few of the kids. Finally, another miner breaks through and opens the way back to the surface. The visitors have just enough time to help Miner Mike sing "Dig Some Fun for Yourself"! ﻿Ages 4 to 10. $225 plus a travel fee if more than 25 miles from North East, MD. Sam is having a tough night. Though he is tired from working hard at the library all day, he just can't seem to fall asleep. To make things worse, the dreaded Pillow Monster is lurking nearby. ﻿So Sam decides to read a children's book that will help him doze off. Audrey Wood's Sweet Dream Pie seems like the perfect choice. He shares some of the story with the audience until the book work's its magic and Sam is sleeping. But then the fun begins! Sam has a crazy dream that wakes him up again. As Sam recalls his dream, volunteers from the audience use their imaginations to make pie pans into a steering wheel, car wheels, headlights, hats, whatever they can think of. Since the dream has interrupted his sleep, Sam tries another book. Over the course of the show, the kids get to be part of the performance as they enter Sam's dreams, improvising with various props and costume pieces that relate to each story. Handmade puppets and original songs, including this summer's theme song, are blended with Dreams by Ezra Jack Keats, Time to Sleep by Denise Fleming, Ira Sleeps Over by Bernard Waber and other great books for kids to create a performance to accompany your 2012 Summer Library program: "Dream Big - Read!" Good books, good dreaming, great fun!! Ages 4 to 10. 50 minutes. Still just $225 plus a travel fee if more than 25 miles from North East, MD. King Rupert is always seeking wisdom and new knowledge. He has been to the Royal Library to learn more about the people and cultures of the world. There he discovers that many of the folk and fairy tales we enjoy have also been set in other countries. A West African Little Red Riding Hood? A Chinese dragon in Beauty and the Beast? A Middle Eastern Cinderella loses her sandal instead of a slipper?? Yes! Grades K to 5. 50 minutes. $225 plus travel fee if more than 25 miles from North East, MD. Sam is searching for a way to find more water for a thirsty world. He and the audience look inside several children's books with water themes. The books introduce Sam to the science and properties of water, which lead him to investigate further. Students will learn how a syphon and pumps make water flow up, about bouyancy, and about sound transmission through water. We sing about ocean dwellers in "The Undersea Library" and some volunteers become Sam's back-up, "Raindrop Chorus" to help sing about the water cycle in "The Water Goes 'Round and 'Round". Your audience will have great fun with books, songs, and puppets, as they learn about the many facets of water and how we have to care for it! Grades K-5. 50 minutes. $225 plus travel fee if farther than 25 miles from North East, MD. Professor Nigel Netwinder will stir your audience's imagination, teach them some insect science, practice language skills, and introduce them to some great kids' books. The Professor is hoping to find the illusive Insecta Libratera in one of the curious garden boxes on stage. Each contains a children's book and an insect puppet that have the kids identifying excerpts, then completing limericks, unscrambling and spelling words, clapping patterns, and learning about the peculiarities of the insect community. In a surprise ending, the Professor and the children learn that they are all "Reading Bugs". Grades K to 5. 50 minutes.$225 plus travel fee if farther than 25 miles from North East, MD. 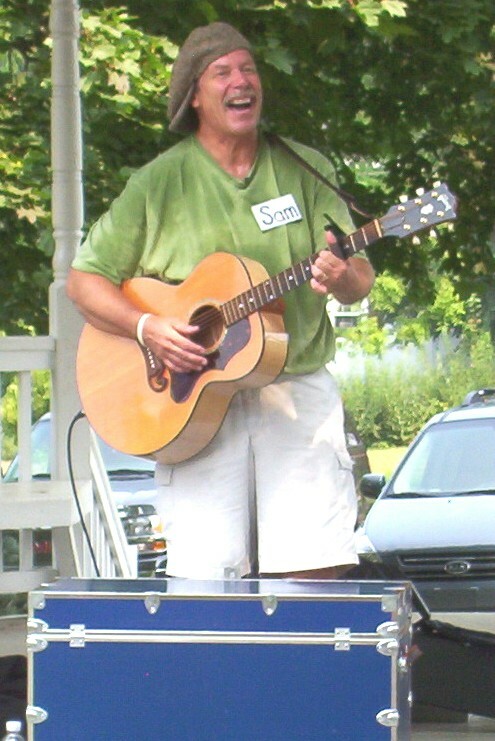 Sam starts the show by singing a song with the audience. But an angry wizard casts a spell to take away his creativity and Sam is left without an original thought in his head! Through the rest of the show the audience and some of Sam's puppet friends must use books to relight Sam's creative fire. Each excerpt they identify from a popular children's book is related to some form of creative expression and restores a bit of Sam's creative mind. Together, Sam and the audience make up rhymes and funny book titles, paint a picture, complete geometric patterns, and do a little dance. Soon Sam has returned to his old self and the audience has taught the wizard to appreciate creativity. Everyone celebrates the creative spirit that lives in each of us by singing "Be Creative With Your Favorite Book". Ages 4 to 10. 50 minutes. $225 plus a travel fee if more than 25 miles from North East, MD. This is a mini-musical starring a 6-foot dragon puppet and Rick playing the King's chef. Rick also becomes King Rupert and Sparks, the King's wizard, in a story of how Edgaar the dragon goes from being a peaceful neighbor to a fire-breathing menace to the people of the kingdom. Ratay, the King's French rat, and Basil the Bookworm round out the cast. The audience helps the Chef make pizza, dodges "fireballs", and helps Sparks make his potion to try to rid the kingdom of the dragon's wrath. But, in the end, it is a discovery by the kids and a look inside a book that saves the day! Ages 4 to 10. 50 minutes. $225 plus a travel fee if more than 25 m iles from North East, MD. This is the show for you if you want to highlight great children's books and encourage reading. This show will engage both kids and adults with interactive singing and audience participation. Sam has an accident and can't remember anything - amnesia!! All he knows is that there is a small notebook in his pocket with his name on it and some writing inside. He reads the first page and the kids identify it as part of Green Eggs and Ham. After a look at Dr. Seuss's book Sam decides he must be a chef. But the recipe he and the kids put into a song proves Sam is a terrible cook! However the book does provide him with a clue - the letter "B". Sam and the audience have a lot more books, songs, and laughter ahead of them, before collecting and unscrambling the letters that reveal his true identity. Your audience will eagerly await the next book that convinces Sam he is an insect biologist, a juggler, a pirate captain, a magician, and an artist. In the finale, the kids will sing about how books can give them endless possibilities for their future. Ages 4 to 10. 50 minutes. $225 plus a travel fee if more than 25 miles from North East, MD. This is a musical play about owning a pet and using books to learn how to choose one and care for it. The Chef is lonely because he works by himself all day. With the audience he sings "Friends, Friends" about all of the neat things you can do with your best buddy. He corresponds with an opera singer (life-sized puppet) but when they meet he finds she is too loud for him! The Chef then decides to get a pet but the pet rock, pet worm, and pet skunk don't work out. A talking book puppet from the library helps the kids teach the Chef how to find an appropriate pet and what he needs to know to care for it. The Chef brings 4 animals (puppets) home from the pet shop in boxes. He sings clues to the kids, they guess what animal is in each, and a volunteer comes up front to make the new pet speak. The final song tells about the kind of books each of the Chef's new friends likes to hear read to them. Ages 4 to 8. 50 minutes. $225 plus a travel fee if more than 25 miles from North East, MD. This performance will get your preschoolers singing, exploring rhythm, helping to tell a story, and moving to guitar songs. Mixed in with familiar favorites like "Old MacDonald" and Shel Silverstein's "Unicorn" are some of Rick's originals like: "I Have to Have 10", a counting song; "Colors, Colors", where kids show how many they can guess from the clues; "Seeds", wherein they act out the life of a plant through the seasons; and "The Undersea Library", about the magical place where sea creatures find their favorite books. There are lots of opportunities to participate in the telling of a folktale and keeping the rhythm of songs with hand-sized shakers. Plenty of fun!! Ages 3 to 5. 45 minutes. $225 plus a travel fee if more then 25 miles from North East, MD. Rick can bring any of his shows to help your child celebrate their special day. Besides presenting an interactive performance for the party crowd, Rick makes and brings a hand puppet as a surprise gift for the guest of honor. 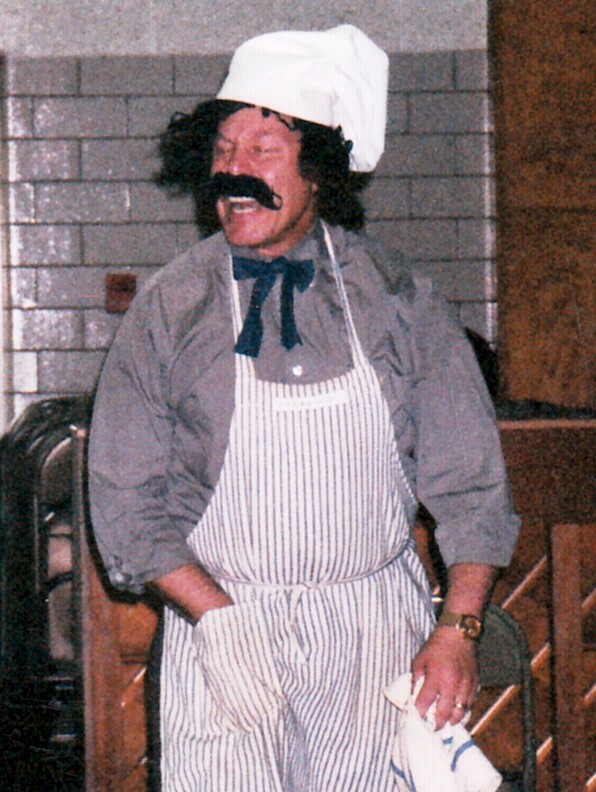 Let Rick entertain the kids while you and your helpers prepare the food and ready the cake. Add a craft activity to accompany the show theme and give the kids something to take home with them and you'll be all set! Ages 5 to 8. 50 minutes. $225 plus a travel fee if more than 25 miles from North East, MD.